This year The Bouncing Souls are celebrating their 30th year as a band, a tremendous milestone by any measure, and one that's even more impressive for a band as consistently active and crowd pleasing as the New Jersey punk legends. In honor of the anniversary, the band has announced the release of "Crucial Moments", a brand new six-song EP and accompanying book, due out March 15th from Rise Records. 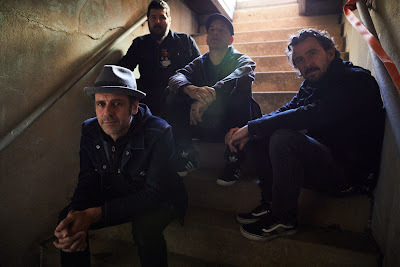 Today The Bouncing Souls are sharing the title track and its music video, an anthemic ode to three decades of great music and great friendships - proof that the band shows no signs of slowing down. Recorded by Will Yip, "Crucial Moments" captures the sound of a band who is still completely in love with what they do after all these years. The four-piece - vocalist Greg Attonito, guitarist Pete Steinkopf and bassist Bryan Kienlen, who started the band in 1989, and were joined by drummer George Rebelo in 2013 - aren't ones to rest on their laurels, as "Crucial Moments" is a wholehearted, fully-realized addition to The Bouncing Souls canon. The EP offers the winning familiarity of the band’s most defining traits bolstered by a long career’s worth of songwriting expertise. If the "Crucial Moments" EP shows where The Bouncing Souls are now, the book is a look back at where they've been. The collection contains photos, memorabilia, and stories from friends and fans to trace the band's incredible career and its impact on the people around them. As Attonito puts it: "We’ve made bonds with people around the world that you’d never imagine or dream of when you’re a 17-year-old kid from New Jersey in the ’80s. I’m so grateful that I’ve been through that journey and for what I’ve learned, and what I’ve been able to get for my heart and to give, too. I don’t know how I can imagine my life being more gratifying than that”. The Bouncing Souls will be spending their 30th anniversary with fans all around the world, having also just announced a massive run of US, UK, and EU tour dates throughout 2019, including a stop in Eindhoven, NL on November 2nd at The Sound of Revolution Festival.